Max is "representing" in the courtroom. Cast: Cowboy – Simon Oakland, Blake – Phillip E. Pine, Dr. Andrew Fish – Howard Caine, Mrs. Dawson – Iris Adrian, Bruno – Richard Karlan, Morovian Ambassador – George J. Lewis, Judge – Frank Biro, Costume Man – Don Brodie, Aunt Rose – Rose Mitchtom. 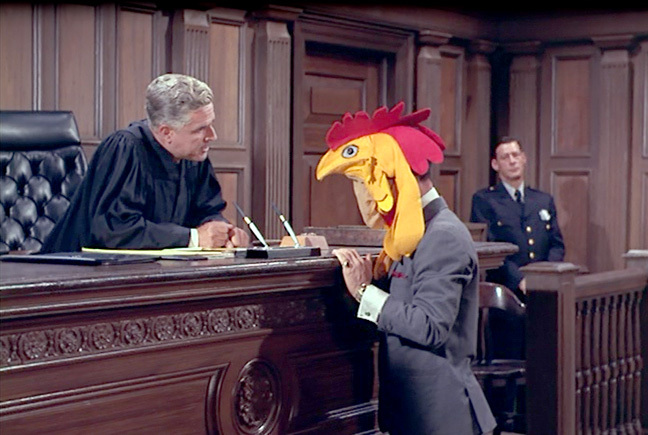 Synopsis: Knowing that Max has to testify at a pre-trial hearing, Kaos pulls out all the stops to make the court think he’s a nut job – including a not-so-dead cowboy and a non-assassination attempt at a formal embassy party. Being stuck in chicken suit didn’t help Max’s case much either. Awkward. Max's attempt to save the day is an epic fail. My thoughts: Sometimes there are things you have to do, but you put them off. Usually this involves doctor appointments or de-hoarding one’s home. Other times it’s writing a blog about an episode you’d just as soon skip. That having been said, I suppose I could end this entry right now. However, I won’t because I know there’s some enclave of fans that get a kick out of this one. Max gets woken from his much needed nappies by a man in a cowboy costume that also appears to be accessorizing with a knife in his back. There’s a bit of shtick with Max getting the guy in his bed, the cowboy’s dying declaration about an assassination attempt at an embassy costume party, a visit from a phony doctor that pronounces the man dead and appropriate scoffing from the Chief. Not about to let the matter rest, Max rounds up the only getup available from an all night costume shop – a gaudy chicken suit. His visit to the Morovian Embassy ended about how his day in court began – bad. 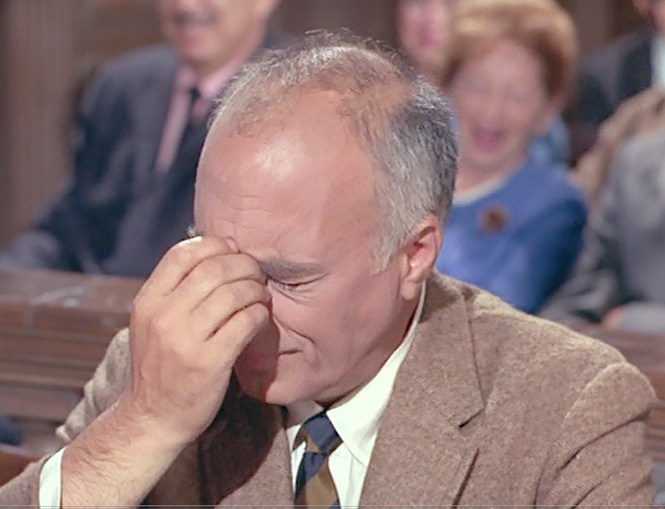 We get a round of witnesses on the stand that pretty much deem Smart not competent to testify — including his land lady Mrs. Dawson who can only cackle at him in disbelief. Even the Chief produces a good solid nose pinch during the hearing. In the end, the Kaos agent’s plan wasn’t so ingenious after all. Max had his ah-ha moment and pointed out that only someone who was in on the scam would know who he was and also be willing to drink a possibly poisoned beverage. Also, this episode’s bad guy didn’t consider the matter of probability when attempting to jump from a five story building onto a pile of mattresses. Missed it by that much. There are a couple of things to make note of with this episode. First, there’s no 99 and she is sorely missed. We do, however, see a painting of 99 in Max’s bedroom. The painting appears in another episode, “All in the Mind.” That painting was the subject of much speculation years ago during our Friday night Get Smart chat sessions. This matter was mulled over in Smartian Controversy Eight. 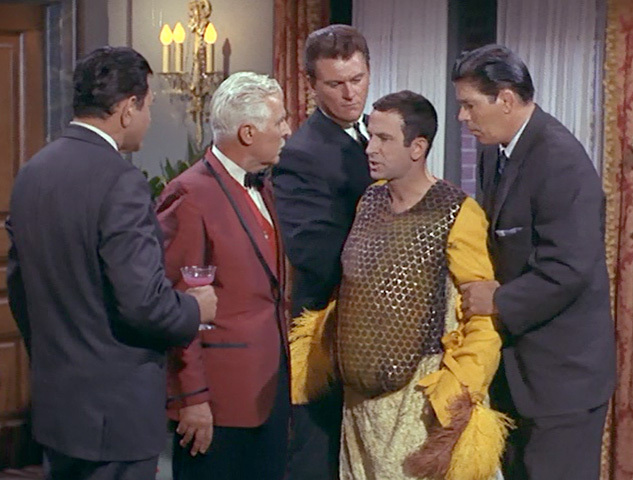 Secondly, the chicken suit is some sort of homage or in-joke with respect to one of the episode’s writers, Pat McCormick. Apparently McCormick had a habit of wearing chicken suits and other goofy costumes to parties. This is noted in Donna McCrohan’s The Life & Times of Maxwell Smart. 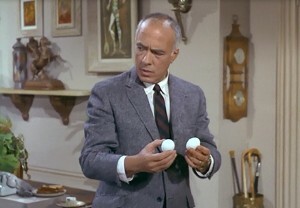 McCormick wrote a few other GS episodes and he appeared briefly in part two of “Two Sire With Love.” He plays Otto, the big Kaos agent charged with mixing Rupert of Rathskeller’s molten goo. That scene always made me snicker. Finally, there’s those eggs at the end. Outside of my personal disdain toward this episode, there really isn’t anything wrong with it. It’s got slapstick, it’s got jokes that are on beat, it has the hero beat the odds — but it also has those awkward eggs Max absentmindedly left setting in his chair. It’s implied that the Chief thinks Max laid them. The scene should at least be cartoony, but it’s not. Watch for: Max’s business card claims he’s Arnold Kipnis, Furrier to the Stars – until you hold it up to the light. Look for Aunt Rose in the courtroom scene. We also learn that the Chief’s first name is Thaddeus. And then there’s that bit at the end with the eggs…. sheesh. This episode provides an Ed Platt nose pinch - with extra frustration. Check out Aunt Rose giggling in the background. • Barbara Feldon does not appear in this episode. • A concert violinist, Simon Oakland played tough guys and appeared in such films as Psycho, West Side Story and Bullitt. He played Kolchak’s editor in Kolchak: The Night Stalker and appeared in Mission Impossible. • Phillip E. Pine appeared in TV shows from the early 1950s to the mid 1980s, including Star Trek and Mission Impossible. • Iris Adrian began appearing in movies at the end of the silent film era. She had roles in many TV shows and through the 1970s appeared in a bevy of those goofy Disney movies, including No Deposit No Return – which also starred Barbara Feldon. • Richard Karlan appears in the second season Get Smart episode “Bronzefinger.” He also appeared in an episode of The Partners (Don Adams’ post-Get Smart series) and an episode of Mission Impossible. • George J. Lewis appeared primarily in westerns, most notably as Don Alejandro in Zorro. 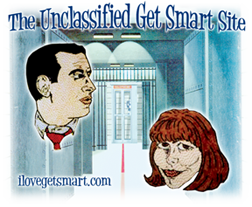 • Don Brodie appears again in the first season of Get Smart in “The Dead Spy Scrawls.” He began appearing in movies starting in the 1930s and his TV series appearances ranged from the 1950s to the 1980s. Oh Max meter: No “Oh Maxes” in this one folks. We do get that lovely painting of 99 in Max’s room, though. Control Agents: No extra agents here. Gadgets: Door Zipper, Plant Phone, Headboard Phone and the unused Painting Phone. No, Chief, Max didn't lay those. He just forgot where he put them. Don't panic.